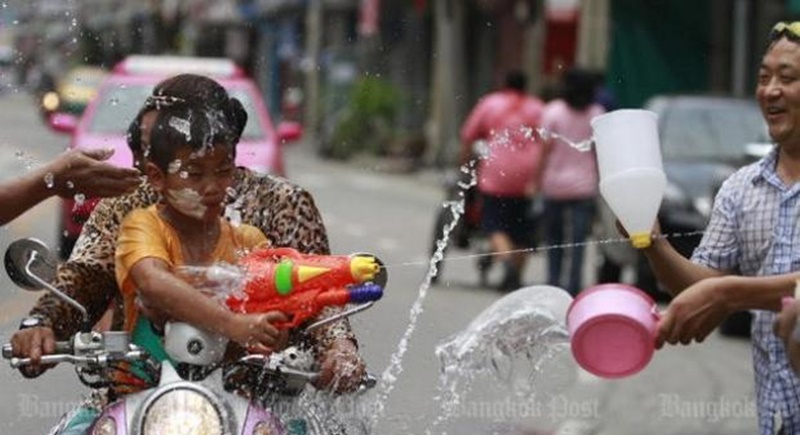 NATIONWIDE: Songkran revellers are being urged to stop their vehicles before throwing water at pedestrians along roads in a bid to reduce traffic accidents, as hospitals in major provinces prepare emergency response measures and medical facilities, according to the authorities. The Royal Thai Police, the Thai Health Promotion Foundation (THPF) and the network for improving quality of life have announced they have jointly launched a campaign to seek cooperation from Songkran revellers to stop their vehicles before splashing pedestrians during the festival. The agencies noted many passengers riding pillion on motorcycles and those on the back of pickup trucks falling over if they throw water at passers-by or vice versa while the vehicles are moving. A 20-year-old man who identified himself only as Art said he and other campaign volunteers would ask revellers in Nakhon Ratchasima to flag down vehicles and ask for permission before throwing water at or dabbing power on the cheeks of those onboard. He said the campaign also wants to put a stop to any indecent bodily contact or harassment. “This is a time to enjoy oneself. No one should be subjected to a horrible experience,” he said. Tee, Mr Art’s friend, said people should know their limits when they celebrate Songkran. They also should not put themselves in harm’s way. He said he and his friends drink together at one of their homes during the festival. They refrain from going out afterwards if they are intoxicated. Rung-aroon Limlahapan, THPF’s director for social risk factor reduction, said 68% of road accidents were caused by or involved motorcycles followed by pick-up trucks, at 12%, during the whole of last year. He was citing figures provided by the Centre for Road Safety. The biggest cause of road accidents was speeding (36%), followed by drink driving (33%). Public Health Ministry figures, show that last year, about 6,000 people suffered a physical disability as a result of road accidents. Of them, about 190 resulted from accidents during the Songkran festival, according to Ms Rung-aroon. Meanwhile, Maharat Nakhon Ratchasima Hospital in Nakhon Ratchasima has readied medical equipment and facilities, including operation theatres, for a possible rise in emergency cases during the festival. The hospital has stocked up on medicine and is calling for blood donations. Dr Somchai Assawasudsakorn, the hospital director, said the hospital normally uses between 160 and 200 units a day. However, demand spiked to 900 units during the Songkran festival last year. Last year, the hospital treated 693 people for road accident injuries, some of whom needed transfusions. Dr Somchai said this year, the hospital targets raising its blood reserve to 1,500 units for use during the Songkran travel period from tomorrow (Apr 11) until April 17. In Udon Thani, Dr Samit Prasannakarn, of the provincial public health office, said his office will direct emergency medical responses, including dispatching ambulances and rescue vehicles to road accidents or other emergencies. Dr Samit said every patient admitted to a local hospital after a road accident will need to take a breathalyser test. At least one police officer will be stationed at each hospital to conduct the test. Also yesterday, motorists were being offered low-priced insurance for the Songkran festival, according to the Office of Insurance Commission (OIC). It said the cheapest policy cost B10, paying out up to B100,000. What would be more appropriate would be to warn pedestrians to not throw water in the face of moving motorcyclists in the malicious hope that they will fall off. Happens every year which is why I now just pull up the drawbridge and sit the holiday out. "...knowing on forehand that no Thai will listen"The message was addressed at all Songkran revellers! Farangs included.Seems like our class clown thinks that tourists etc.don't drive on Pickups or don't throw water at passing by motorcyclist's.Shows again how biased he is!Thai's don't listen ,other people do! Perfect picture to show the foolishness of official "measures" urging Thais to be safe. A stupid irresponsible lady with a helmetless kid standing on a motorbike while other ignorant fools chuck water in their face as they ride by. This is really just a great time to stay home and steer clear of the madness.